In 1992, Rio Burke, the last surviving member of Al Capone’s gang, visited Miami Gardens. Rio was born Raye Rucker in Richmond, Kentucky, and later changed her name to Raye when she went to work for Big Jim Colosimo, performing at the age of 19 as a singer at his nightclub located at 2128 S Wabash Ave., Chicago, Il. If her singing career didn’t already make her famous, her first marriage eventually did when she took the hand of Dominic Roberto (aka Roberts) on April 14th, 1924. Dominic owned a nightclub in Chicago Heights, and they lived in the residence with Jim Emery for 5 years. It was during that time that Dominic became a top lieutenant for Al Capone, when he formed an alliance with the other club owners to overthrow Philip Piazza, then mob boss residing over the Chicago Heights syndicate. Piazza had been collecting protection money from all the Chicago Heights club owners, but stopped all payments to the Chicago Outfit when Torrio left town. Piazza did not support Capone. 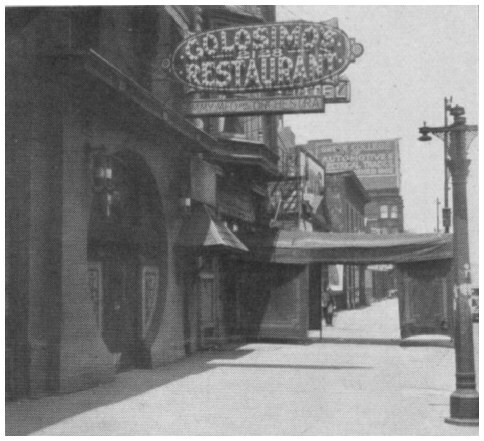 With the alliance in place, Dominic secured the assistance of Capone, and on July 22nd, 1926, 2 gunmen killed Piazza outside his Milano Cafe at the corner of 16th and Lowe. All of Piazza’s lieutenants were eliminated, and Dominic Roberto became Capone’s lieutenant over the South territory that stretched from 95th Street in Chicago South to Kankakee, Illinois, which was managed by the Macaluso brothers; East to Gary, Indiana; and West to Joliet, Illinois. As Rio toured our building, recalling many details about Miami Gardens from her past; (information that we preserved from that special visit) one of her first memories was about Frank Nitti, Al Capone’s cousin. Rio talked about him as if it were yesterday, providing many details about an evening when she witnessed Frank Nitti shoot a hitman, from St. Louis, that was flirting with his girlfriend. The victim was at Miami Gardens to “cool off” after doing a job for the Outfit in Chicago. The Strip in Calument City was the Midwest’s version of Las Vegas, and featured all the usual amenities including top entertainment, gambling and alcohol.